The SR-130 provides higher power, state of the art technology, system reliability and low maintenance, all in a small footprint, lightweight package. The SR-130 was designed with agility in mind. It's compact, lightweight construction makes it easy for the operator to move the system effortlessly. 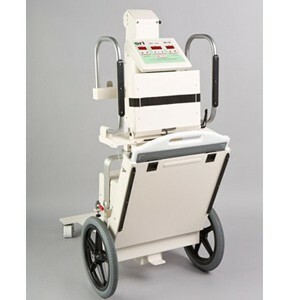 Delivering maximum mR/mAs, the SR-130 produces 3 kW of power that provides hospital quality imaging, performed anywhere, anytime a Portable X-Ray System is transported to a patient. The SR-130 is a user friendly system designed for high reliability and the durability required for the Diagnostic Outreach market. The SR-130 can be used in hospitals, clinics, nursing homes, private homes, orthopedic practices, sports medicine, correctional facilities and military field deployable applications. Indicators = Digital display of kVp, mAs and Time. X-Ray, Ready, mA Station and Fault indicators.